With over 4 million articles, Wikipedia is an invaluable resource, whether you're throwing a term paper together at the last minute, or trying to find a stretch of the Gulf Coast that isn’t currently covered in oil. But follow enough links, and you get sucked into some seriously strange places. We explore some of Wikipedia's oddities in our 4,478,171-week series, Wiki Wormhole. What It’s About: Thanks to its isolation, not to mention being one of the last places on Earth for humans to settle, Australia is home to a fascinating array of animals not found anywhere else in the world, from the iconic koala and kangaroo, to the intelligent-design-disproving platypus and Cassowary. But before the arrival of humans roughly 50,000 years ago, Australia was home to some larger, stranger animals, which were hunted to extinction (or wiped out by the ice age; there still isn’t a scientific consensus). Commenter Tjardus Greidanus pointed us to this list of flightless birds, 10-foot kangaroos, and other antipodean oddities, both extinct and still roaming the outback. Strangest Fact: Australia and surrounding islands are home to several large flightless birds. (New Zealand’s now-extinct moa was not only flightless, but wingless, making it one of the only animals ever to exist with only two limbs. Just to recap, intelligent design is just a really, really stupid theory). One of the strangest and most terrifying has to be the Bullockornis planei, an 8-foot-tall, 500-pound bird with a large, sharp beak, which was almost certainly designed for devouring prey. The bird is likely a distant relation to ducks and geese, and that, coupled with what must have been a terrifying appearance, has earned it the nickname The Demon-Duck Of Doom. Biggest Controversy: As mentioned above, there isn’t a scientific consensus on how the bulk of Australia’s megafauna died out. While the evidence seems to point to human activity over changes in climate—mass extinctions coincided with humanity’s arrival on the continent, and many of these animals had survived millions of years of hot and cold beforehand—the theory that dry weather during the last ice age wiped out several species has numerous, vocal adherents, and Wikipedia notes that on this subject, “politics and ideology often takes precedence over scientific evidence.” Thank goodness that kind of thing hasn’t happened in, say, every other situation in human history. Thing We Were Happiest To Learn: Our longtime dream of opening a Jurassic Park-style resort full of 3-ton primeval wombats is less of an acid-induced hallucination than we previously thought. Diprotodon optatum, the largest known marsupial ever to have lived, was essentially a 6,000-pound hippopotamus-sized wombat. It’s believed that the Diprotodon may be the source of the Aboriginal legend of the bunyip, a Bigfoot-like monster that haunts lakes and rivers. Thing We Were Unhappiest To Learn: The Crocodile Hunter wouldn’t have lasted 10 minutes in prehistoric Australia. Besides salt- and freshwater crocs, Australia is home to the goanna, or monitor lizard, a similarly shaped carnivorous reptile. But the 30 species surviving today are merely tiny versions of Megalania prisca, which were over 20 feet long and may have weighed as much as 4,000 pounds, making them the largest lizards ever to walk on land. As if that didn’t make them scary enough, it’s believed they also had a poisonous bite, like the similar lace monitor. Also Noteworthy: Even the turtles were gigantic and scary in ancient Australia. 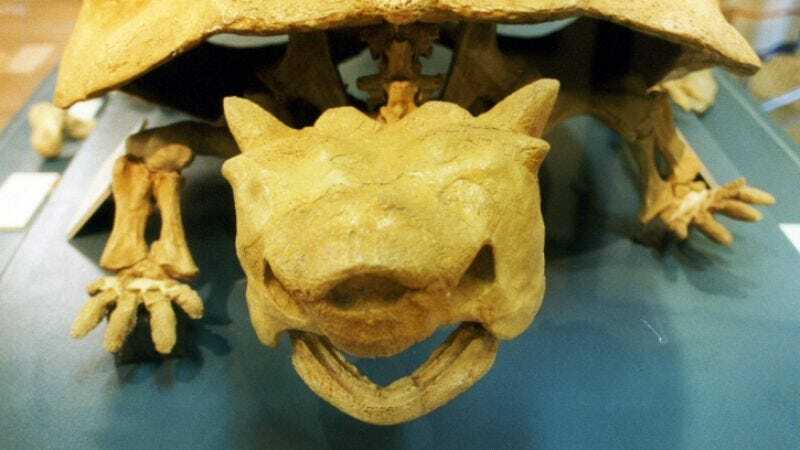 The meiolania, which survived the mass extinctions of 50,000 years ago, and only went extinct around 2,000 years ago, was a stegosaurus-like turtle that not only had a shell, but also horns and an armored, spiked tail. At 8 feet long, meiolania is history’s second-largest known turtle, behind the Pleistocene Era’s 9-foot Colossochelys atlas. Best Link to Elsewhere On Wikipedia: One of Australia’s most important archaeological sites, Cuddie Springs is the source of fossil evidence for many of these species. Or, if you’d like a grim preview of where climate change and overconsumption are leading us, read up on the Quaternary extinction event, in which innumerable species—large mammals in particular—died out en masse.